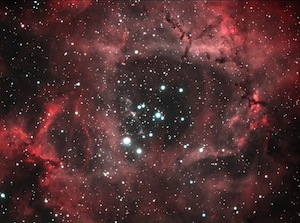 The Rosette Nebula is a star-birth region of our Milky Way galaxy. The nebulosity is mostly deep-red Hydrogen-alpha light emitted by a cloud of interstellar hydrogen atoms. This cloud of atoms is slowly condensing to form young stars. The stars give off light, which excites the hydrogen atoms in the interstellar nebula causing the nebula to glow. It is believed that stellar winds from the bright young stars exerts pressure on the interstellar cloud causing it to compress into the shape that we see here from Earth. This picture was taken from my driveway with my 4 inch refractor using H-alpha and O-III filters to cut through the light pollution.